Firefighters in Greece are battling a large forest fire sweeping across the eastern Aegean island of Chios. The fire began in the early hours of Saturday and has been fuelled by gale force winds. Authorities said that by Monday the blaze had destroyed about 7,000 hectares (16,000 acres) of forest and farmland. Residents of nine villages and hamlets were evacuated from their homes over the weekend as the fire approached. Chios lies north-east of the capital, Athens, off the coast of Turkey. The island is famous for its production of mastic, a natural, gum-like resin with a distinctive flavor produced only by trees on certain sections of the island. Used as a natural chewing gum, a cooking spice and for pharmaceutical and cooking purposes, mastic resin is a major source of income for the islanders. The strong winds were hampering efforts to extinguish the fires, despite the presence of several hundred firefighters, soldiers and volunteers, as well as firefighting planes and helicopters. Wildfires are common during Greece’s long, hot summers, though some are believed to be started on purpose. 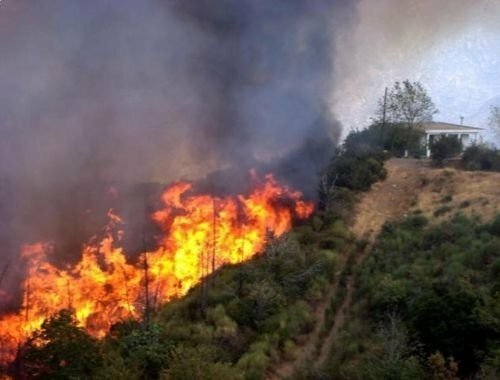 A further five forest and brush fires broke out on Monday across Greece, the Associated Press news agency reports, while fire crews continued to fight six fires already burning in other parts of the country. The government has requested the assistance of water-bombing aircraft from Spain and Italy to help with the summer blazes.